As I'm working on this year's holiday cards, I've been pulling out some from previous years. Some of the trends I've spotted: I love snowflakes - maybe because we so seldom get the real thing. I love using shades of purple and lavendar on cards. Last Christmas I made several of this card by printing the greeting on ivory paper and then stamping the snowflakes in various shades mostly from the Soft Subtles family of inks from Stampin' Up! 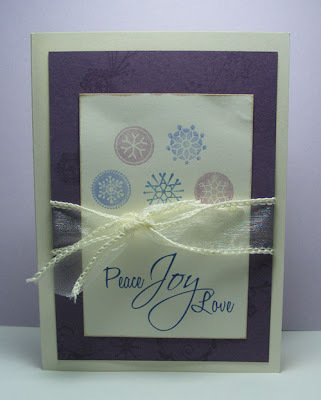 The purple background paper is stamped in Versamark with a swirly snowflake holiday design from Indakindado to add a little depth to the card. I also love to use sheer florist ribbon. If you use wire ribbon, be sure to trim after you tie your bow to get those little wires that stick out of the ends. This type of ribbon is inexpensive and adds a subtle layer to a card. Paper and ribbon: sources unknown.